Stevie is awesome. Recenlty, a guy with a guitar singing in a lobby in Los Angeles got the surprise of a lifetime: Stevie Wonder. Apparently, Grayson Erhard, who was performing in a Los Angeles hotel, had problems remembering the lines in Stevie Wonder's 1972 classic, "Superstition." Little did he know that Stevie Wonder was in the audience. This is a great moment, caught on video, as Stevie joins him on stage. 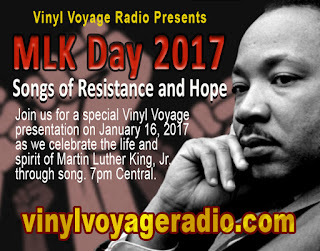 If you missed our special Martin Luther Kings Day special, "Songs of Resistance and Hope," you can now listen to it on demand via Mixcloud. 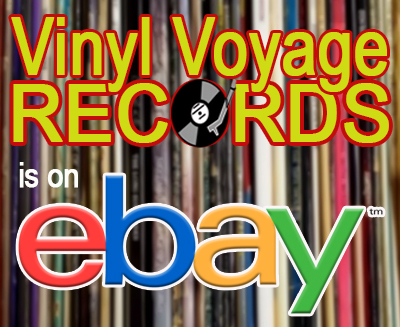 This special features the music of the Isley brothers, Nina Simone, Ray Charles, Richie Havens, Steel Pulse, the Staple Singers, Mavis Staples, Carmen McRae and many more. Join us on January 16 for our 2nd annual Martin Luther King, Jr. Day special presentation. This year's theme is "Songs of Resistance and Hope," featuring artists such as the Isley Brothers, Ray Charles, the Staple Singers, Marvin Gaye and many more. 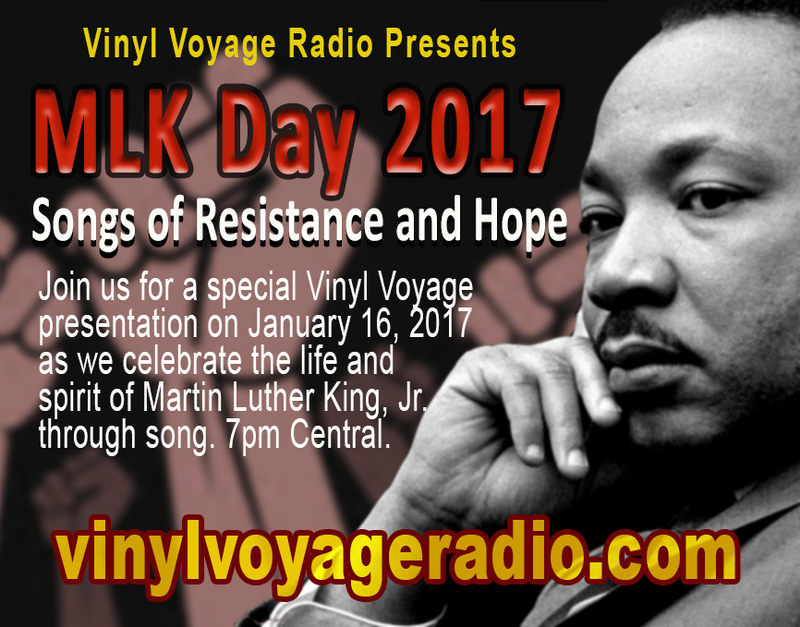 The show airs at 7 pm central on Monday, January 16, 2017. Haven't had a chance to listen yet to Vinyl Voyage Radio's special, A 2016 Retrospective: Those we Lost? Now worries. It is now available on-demand at Mixcloud. 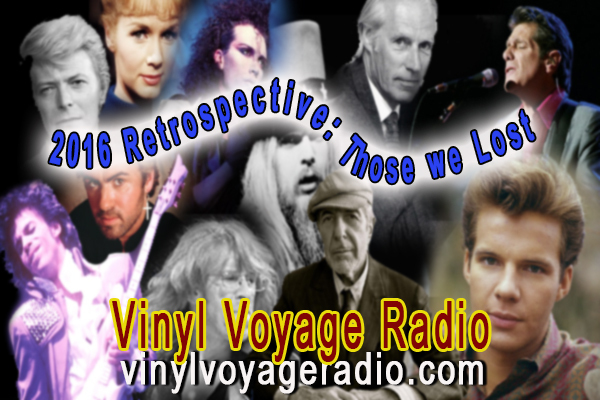 Vinyl Voyage Radio presents a special retrospective regarding the musical artists we lost in 2016. In the last year we lost over 600 people in the music industry. On this special, we highlight just a few. Join us for over an hour of music from some of those we lost in 2016. Hosted by Bruce Janu. Next week, the special will be available on demand. Happy New Year! 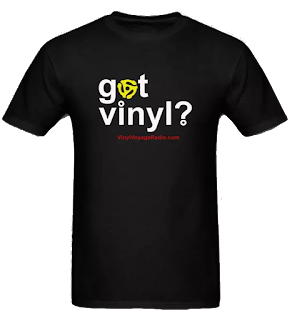 We begin the 2017 season of Adventures in Vinyl with a great treat. 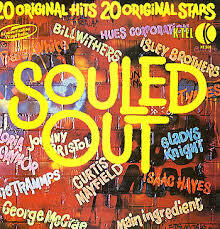 On the last episode, we spun K-Tel's 1975 release, Souled Out. This month, we will listen to the UK version of the album. K-Tel released multiple versions of many of their albums in different regions. The UK version of Souled Out has a different track list than the US version. And, in my opinion, a better track list, too. This episode comes to us courtesy of a listener who goes by the name Johnny Gators. He sent me a vinyl rip of this album. He also has a show on the No Hold Barred Radio Network, a channel specializing in adult comedy and talk. Another Monday, another day of 80s music. It's Manic Monday!